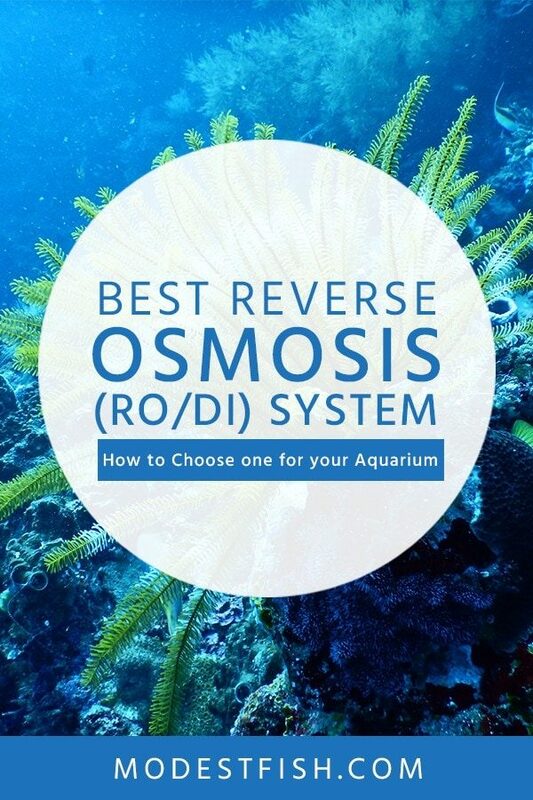 Wondering what the best reverse osmosis system is for your aquarium? You’re in the right place. In this article, you’re going to learn how to select a RO/DI (reverse osmosis deionized water) system based on your needs. I’ll also share my reviews for the best currently on the market for all budgets. While every reverse osmosis system is designed to take water from your tap or hose and purify it for use in your aquarium, not all of these systems were designed to the same specifications. Some reverse osmosis systems have huge capacities for large tanks that need frequent water changes, while other reverse osmosis systems have extra filtration stages to provide extra purity. In order to determine what reverse osmosis system you need for your aquarium, there are a few important features of these systems that you need to understand: the flow rate, the number of filtration stages, the membrane, and the system certifications. How Many Gallons per Day (GPD) of Purified Water do I Need? The gallons per day (GPD) rating of a reverse osmosis system describes the maximum amount of water that the system can filter from the tap to final purity in 24 hours. An important caveat to the GPD is that it describes the amount of water produced if the system is run at maximum pressure for the entire 24-hour period – so many taps will only produce about 60-85% of the rated GPD. The number of gallons of purified water you need from your reverse osmosis system will depend on the size of your tank, the frequency with which you flush the water, and whether your reverse osmosis system is connected to a storage tank. In general, as long as you can store the excess purified water, a reverse osmosis system with a higher GPD rating is better since it can produce water on demand at a faster rate when you want it to, which means you won’t have to wait around for hours for several gallons of purified water. To determine the absolute minimum GPD rating you need, divide the size of your tank in gallons by the number of days between when you change the water – your reverse osmosis system will need this minimum GPD production to keep up with your water changing cycle. On the other hand, if you connect your reverse osmosis system to a storage tank, you can produce purified water beyond your strict need and pull from your storage container when you change the tank water. Although it is also possible to filter water from the system directly into an open plastic bucket, if you are not careful about keeping an eye on the bucket filling it can easily overflow. How Many Filtration Stages do I Actually Require? Another important consideration for your reverse osmosis system is the number of filtration stages the input tap water is run through before it is output as purified water. Reverse osmosis systems generally come in three-, four-, or six-stage filtration systems, although systems with even more filtration stages are available for extreme purification needs. 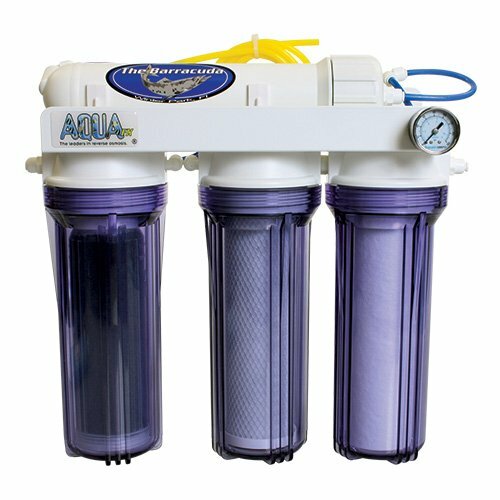 Three-stage reverse osmosis systems are inexpensive as well as relatively compact and lightweight, making them easy to store underneath your aquarium tank or in a drawer when you are not filtering water. They typically include a sediment pre-filter and a carbon filter to remove minerals and other significant impurities ahead of the reverse osmosis membrane. 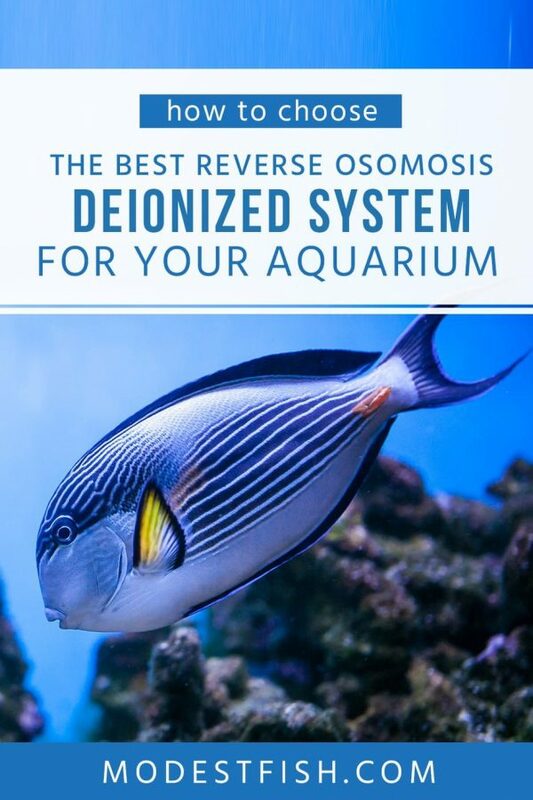 However, most aquarists will opt for at least a four-stage reverse osmosis system since this includes a deionization stage after the reverse osmosis stage. This deionization balances the pH of the water before it is released into the tank and adds back some minerals to the water to balance the ions in the water. Six-stage reverse osmosis systems expand on the four-stage system by adding in a second carbon filter before the reverse osmosis membrane and another between the reverse osmosis and deionization stages. Together, these two additional carbon filters help to remove chlorine, volatile organic compounds, and any cloudiness and odors from the water as it moves through the purification steps. How many filtration stages you need depend on the type of tank you are filling. A delicate reef tank may benefit from the purity of a six-stage reverse osmosis filter, whereas a hardier saltwater tank environment may not suffer any ill effects from a less expensive and faster four-stage reverse osmosis system. What Type of Membrane do I Need? 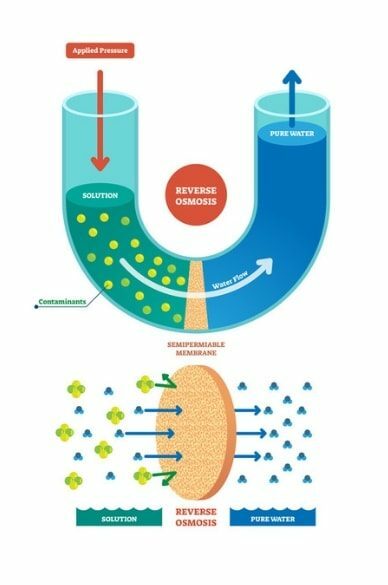 The reverse osmosis membrane is the heart of any reverse osmosis system since this is the membrane that captures the solids dissolved in your water. Cellulose tri-acetate (CTA) membranes are best for tap water that is already relatively pure since they have lower impurity removal rates, of 88-94%, than other reverse osmosis membranes. In addition, it is important to use CTA membranes only with chlorinated water since they can otherwise grow bacteria – so most six-stage reverse osmosis systems that use a carbon filter to remove chlorine will not use CTA membranes. Thin film composite (TFC) membranes remove 94-98% of total dissolved solids from your water and are much more common in six-stage filtration systems since they can be damaged by chlorine and thus require a carbon pre-filter. For the most sensitive aquarium tanks, look for a six-stage filter that has a high removal membrane, which are capable of capturing 97-99% of solids dissolved in your water. These filters are typically found in six-stage systems since like TFC membranes, they require a carbon pre-filter to remove chlorine. Whenever buying a reverse osmosis filter, you should look for FDA (Food and Drug Administration) and NSF certifications. 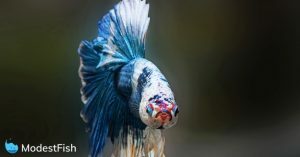 NSF is a consumer product testing laboratory, while the FDA certification indicates that the water coming from your reverse osmosis system is safe enough for humans to drink – something you’d like to be sure of before you fill your aquarium tank with it. 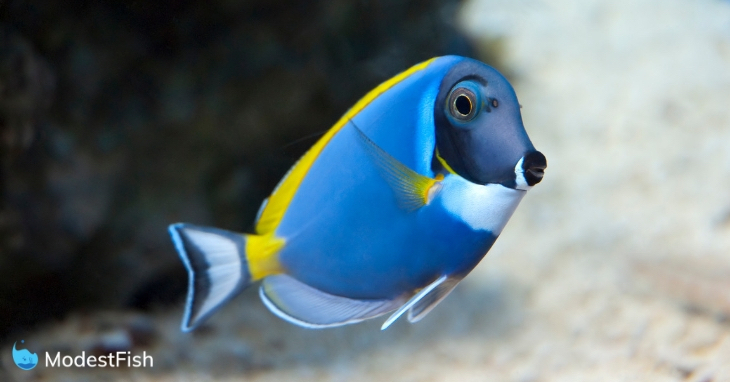 While you could add water straight from your tap to your aquarium, chances are your fish wouldn’t last long. The reason is that tap water contains a huge number of chemical impurities that don’t bother our bodies but can drastically upset the environment your fish are used to living in. While many contaminants, like chlorine and sediment, can be removed with standard filters or with chemical treatment, among the nasty things in tap water that are much more difficult to get rid of are dissolved minerals – including arsenic, lead, and nitrates – cryptosporidium, and tiny dissolved solids. All of these can be harmful to fish and won’t be removed by traditional carbon filters. A reverse osmosis filter is able to remove more than 90% of these contaminants, and depending on the membrane used reverse osmosis can filter out more than 99% of contaminants. The result is purer water for your aquarium, which means healthier and longer-living fish and fewer problems with algae growth. To help you find the best reverse osmosis system for your aquarium, we reviewed five reverse osmosis systems that pair well with a wide range of aquariums. In addition, our reviews offer guidance on why these systems are good options for different aquarium setups and budgets. This four-stage reverse osmosis system is pricey, but it’s one of the most effective systems on the market when it comes to removing total dissolved solids. 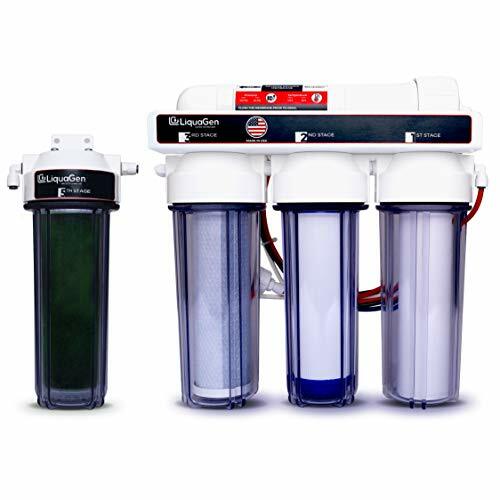 The filter system comes with a TFC membrane that is specifically designed for removing silicates, and there are two digital total dissolved solids monitors on the system so you can monitor the water that is coming out of the filtration. The system is rated for 90 GPD, which is more than most users need but is perfect for quickly filling a storage tank with purified water for your next tank refresh. In addition, this system reduces its wastewater so that it produces only twice as much waste as purified water, in contrast to the four times as much produced by most other reverse osmosis systems. The life of the TFC membrane is extended thanks to an extremely easy to use manual flush valve. SpectraPure also offers a three-year warranty on the system in case of any problems. This six-stage reverse osmosis system from Koolermax is a great option for aquarists on a budget thanks to its surprisingly low price point. The system comes with everything you need to start filtering water, including a pressure gauge so you can monitor when the carbon pre-filters need to be replaced. A great after-market addition is a dual TDS meter to place inline before and after the deionizing filters, so that you can monitor when the filters need to be replaced. When running at full pressure, the system is capable of a massive 120 GPD so you can expect to fill a bucket to top off your tank in less than a few hours. 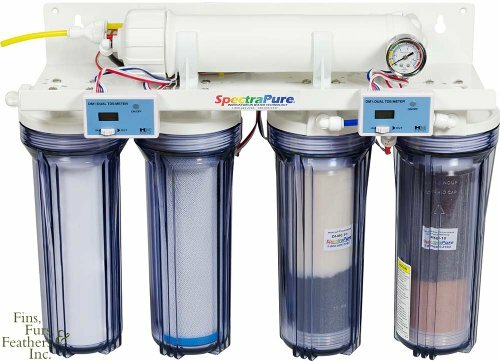 The reverse osmosis membrane is capable of removing more than 98% of total dissolved solids, although compared to the TFC membrane on the SpectraPure system it only removes about 90% of silicates. This four-stage reverse osmosis filter is a good option for those who want a smaller filter than the Koolermax and don’t need the ridiculously fast 120 GPD production. With a 50 GPD rating, this filter will work relatively slowly so you will likely want to invest in a water storage tank so you can leave it running throughout the day and night. 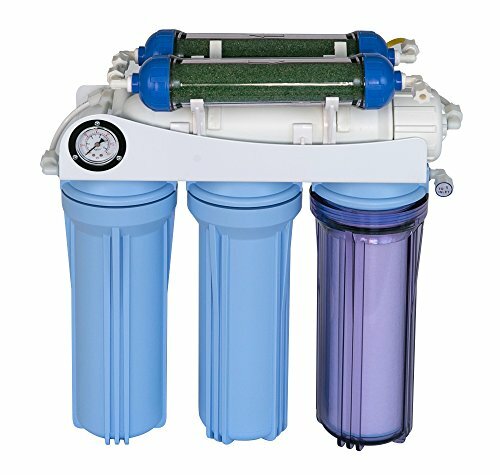 The TFC reverse osmosis filter works extremely effectively and produces water that consistently measures zero total dissolved solids. The waste to purified water ratio on this unit is relatively high – above 4:1 – so expect to produce a lot of wastewater that will need to be recirculated to your drain or outside. This six-stage reverse osmosis filter from LiquaGen offers many features similar to the SpectraPure system, but at a lower price point. 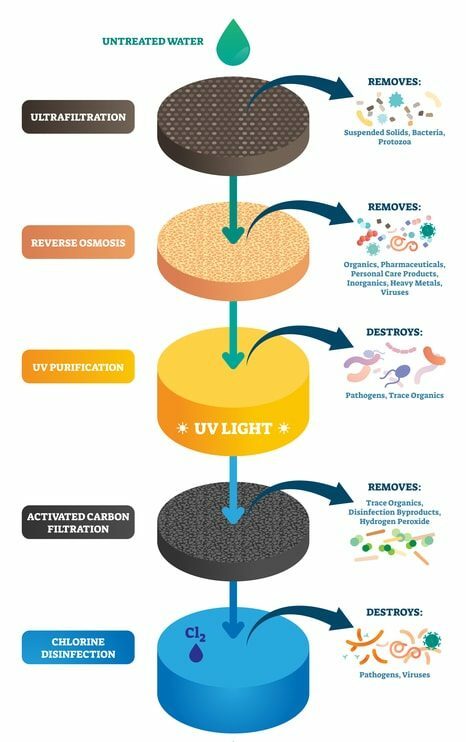 The two carbon pre-filters are made of different materials – one of UDF-activated carbon and one of coconut carbon – to filter out a wider variety of impurities in addition to chlorine. The system also comes with a dual inline total dissolve solids meter and a pressure gauge so you can monitor the output water and gauge when it is time to change the filters. The system is capable of filtering water at up to 100 GPD, although LiquaGen also offers a 150 GPD version for those who want to fill their buckets more quickly. The TFC reverse osmosis membrane is extremely effective – it removes more than 98% of total dissolved solids. The filter line has a manual flush line, making it easier to flush the system and helping to extend the life of the system. The system comes nearly pre-assembled with the flow restrictor already inline so you can start using the system as soon as it arrives. This six-stage reverse osmosis filter is designed to fit under the sink while still providing up to 75 GPD when running at full pressure. The early filtration stages feature both activated carbon and coconut carbon filters to ensure chlorine removal ahead of the reverse osmosis membrane and completely capture volatile organic carbons. The TFC reverse osmosis membranes completely remove total dissolved solids, and you can monitor the membrane and deionization filters thanks to the inline dual total dissolved solids meters. The TFC membrane lasts approximately two years, although flushing the system without a manual valve can be more of a hassle than on the LiquaGen or SpectraPure systems. 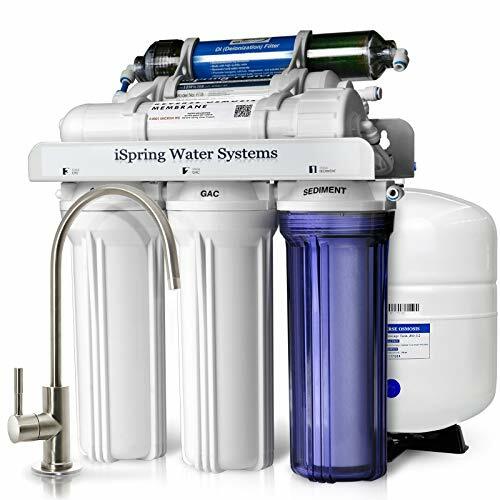 iSpring provides a one-year warranty and one-year money-back guarantee on the system, but also offers lifetime technical support – which can be a major advantage if this is your first reverse osmosis filtration system. A reverse osmosis system is an efficient, economical way to produce high-purity water in large volumes for your aquarium. 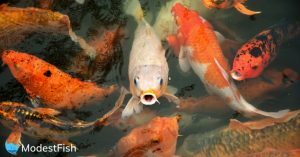 These systems vary in the number of filtration stages they offer and the membranes they use, but the best systems fully remove minerals, dissolved solids, and deionize the water to provide a healthy environment for your fish. The SpectraPure and LiquaGen filtration systems are great choices if you need a fully-featured six-stage filtration system, while the Koolermax and AquaFX systems may be better choices if you’re on a budget and don’t need quite the same level of water purity in your aquarium.